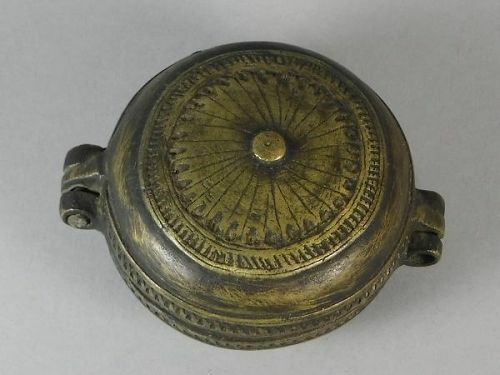 A small round antique ethic tribal hinged bronze betel nut box from Southeast Asia. Measures about 3 inches diameter. 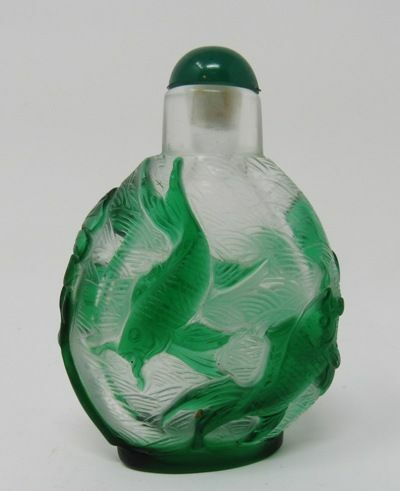 Vintage hand carved Chinese Peking glass snuff bottle with fish. Note how nicely the background is carved with a wave pattern, a very nice detail. 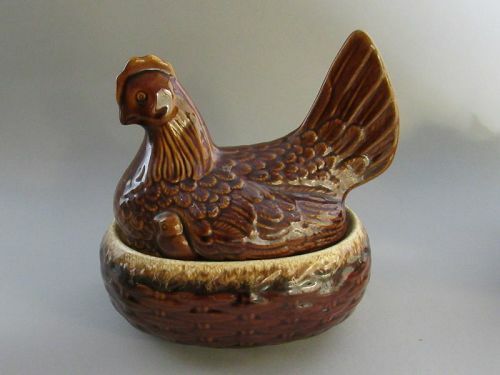 Measures about 2.75" high. Dates pre-1985. More photos available. 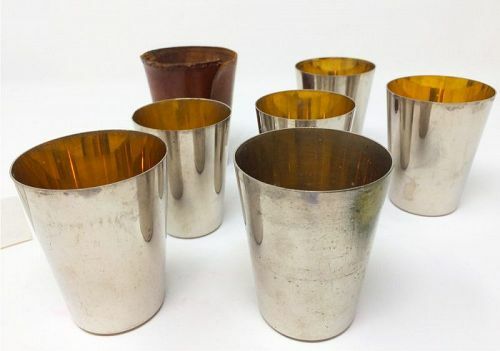 Set of 6 metal cups in a leather case marked with the date 4/22/1925 on the bottom. On the lid is inscribed: Doctor W. E. Stern, 1099 Brunswick Ave, B'klyn N.Y. Measures in case 3.25" high x 2.5" diameter. 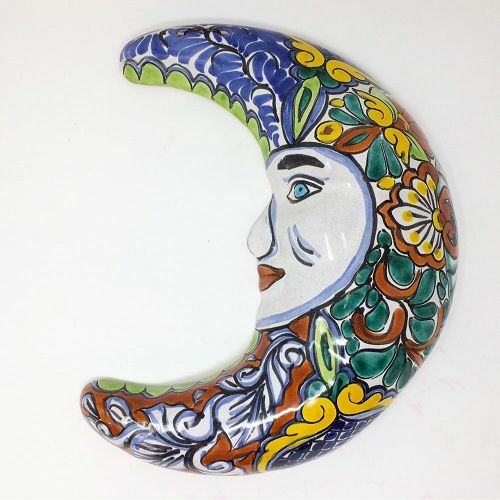 Vintage Mexican ceramic half moon wall art hand painted by T. Castillo. Very colorful and in excellent condition it is signed on the back by the artist. 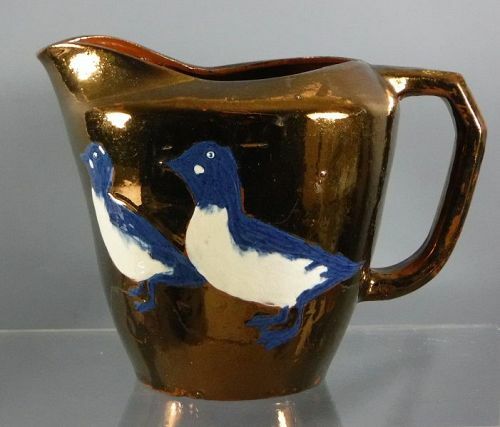 Measures about 12 inches high. 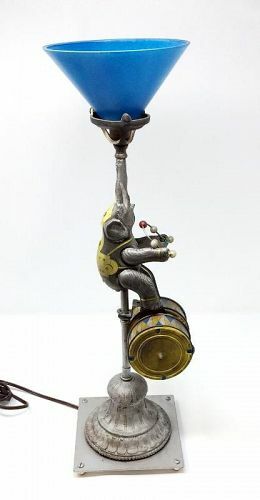 A lithographed tin elephant holding drumsticks while standing on and drums toy that was converted into a lamp. Signed by "Matthew Lee Gotwols '02". Measures 21 inches high. 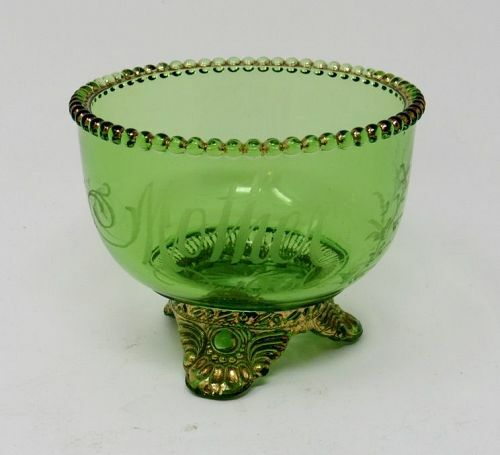 Small Victorian green glass footed bowl with a beaded rim. 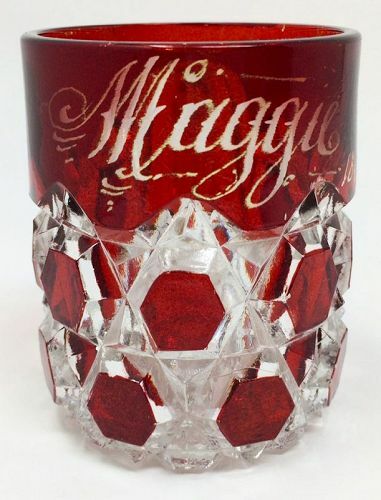 Etched in script is the word "Mother" and below the year "1906". A sprig of flowers are etched to the right of Mother. Back of the bowl is plain. Gold gilt on beading and feet. 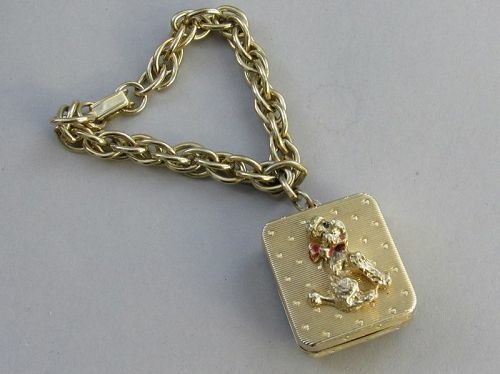 In excellent antique condition with normal wear to gold, it measures 3.75" diameter x 3" high. Bitossi vase with a varied striped glaze consisting of orange, yellow, browns with gold gilt accents. It is marked on bottom with identification number and Italy. In excellent original condition, it measures 10 inches Circa 1960-62. 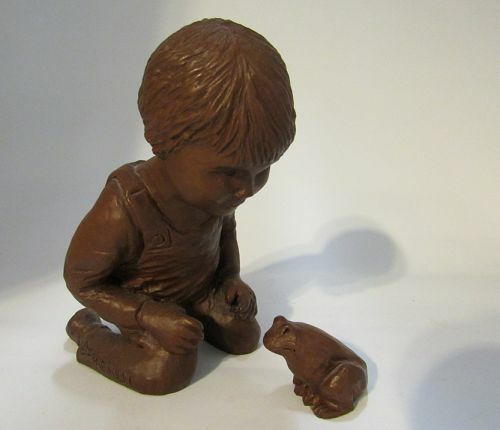 Vintage figurine of really cute puppy made from pressed pecan wood. It was manufactured in the USA by Red Mill Mfg and the original label. 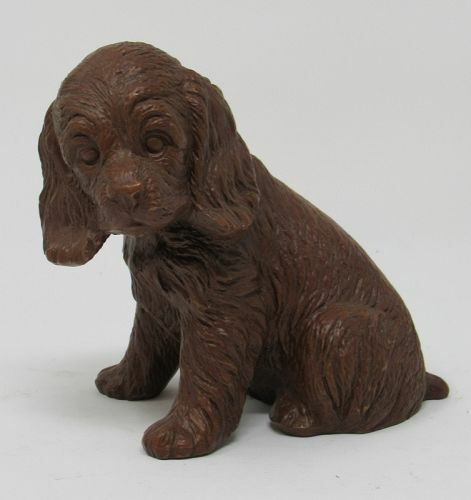 The dog looks much like a cocker spaniel or golden retriever puppy. In excellent condition, it 5" x 5". Circa 1950s. Old Chinese porcelain chop or seal with mountain scenes and poems that was used on a scholar's desk. When on its side the seal doubles as a wrist rest to steady the hand when doing calligraphy or painting. 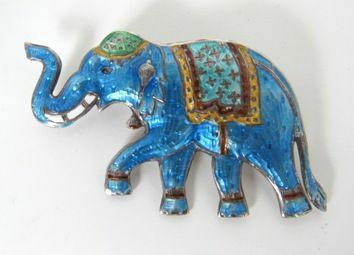 Has some age related wear, but considered to be in very good antique condition. 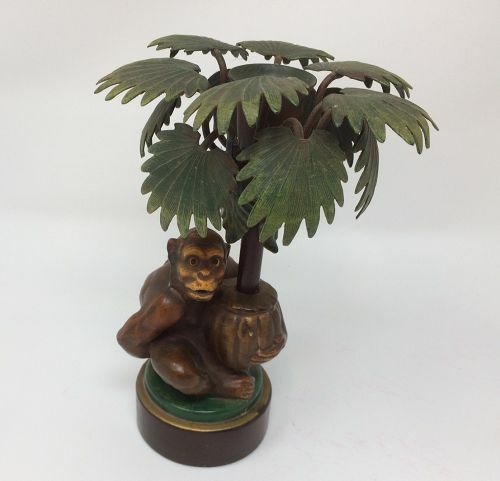 Dates early 20th century and measures just under 5 inches high. 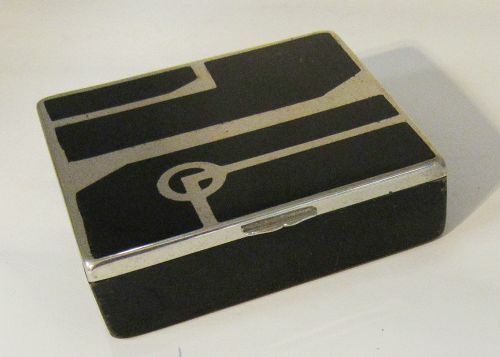 Art Deco wood lined metal hinged cigarette box. A perfect example of art deco design. Measures 3.25" x 4.5"